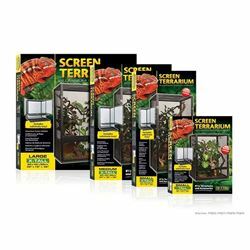 The screen design provides a broader temperature gradient, which helps your reptiles to regulate their body temperature more effectively and prevents overheating. The aluminum screen mesh allows ultraviolet rays from UVB lights or the sun to penetrate deep inside the enclosure. The substrate tray allows you to place a small layer of substrate to absorb spray water and increase humidity levels. The substrate tray can easily be removed from the enclosure through the swiveling bottom door. The Sturdy nickel plated latches add stability to the enclosure and keep your reptiles safe & secure. Add an Exo Terra Background (optional) to raise humidity and to collect misting water for species that prefer licking water droplets, such as chameleons, day geckos and many other arboreal species. The Screen Terrarium can easily be assembled using a single screw driver.